I will write about my club at school. I'm in the gymnastics club. We practice every day except Fridays. We practice from 4:00 PM to 8:00 AM. We practice much longer than most other clubs. Everyone practices hard. Clubs at Japanese schools are different than those in many other countries. Students don't change clubs each season. We play the same sports or participate in the same clubs all through high school. We practice for our sports all year round. Thanks to this system one sport is enough for us. Which do you like better? Playing only one sport or a few? I would chose the Japanese way because we can become very good at this one sport. But there is a problem, too. I am good at gymnastics but weak at other sports. For example, I am very weak at ball sports. The Japanese way has good and bad points. What do you think? I went to Kobe in November last year. I went there to take part in a hand bell choir festival. Many people, both children and adults, joined the festival. I could get a lot of knowledge and see many interesting things during the two-day festival. There was a big earthquake in Kobe only 5 years ago. Yet, the downtown of Kobe was very beautiful and lively. But, there were earthquake marks in different areas of the town. I could understand how much damage the earthquake did. I think that these wounds will never ever go away. I have been in the music club for three years. Last week, we held a concert called the “Winter Festival.�E Five schools took part in the festival; Seibo Gakuen, Hanno High School, Hanno-Minami High School, Okawa Gakuen, and Jiyunomori Gakuen. So, I could make many new friends there. Practice was harder than usual, but it was very interesting. It is now a very good memory of mine. I'm sad because I can't meet my new friends very often, but I'm looking forward to seeing them again next year. We have very little time until our graduation. So, I want to enjoy the precious days that we have left. I was in Chiba, at the junior high school's Seaside School, when Seibo Gakuen won the Saitama baseball championship. Everyone was so excited. As a foreigner, it was hard to understand all of the excitement. I thought that it was great that they won, but I didn't understand how special the Koshien was to many Japanese people. When we arrived back in Hanno, there were posters everywhere that said things like, "Congratulations Seibo Gakuen!" Friends from far away places like Choshi, Kyoto, Nagoya, and Yokohama, called or e-mailed to congratulate me. Suddenly, Seibo was famous. We had a special assembly to honor the team. Hundreds of students, parents, supporters, and teachers would be going to watch the team play. We practiced many special songs, cheers, and dances. Unfortunately, I couldn't go and watch the game because I had to return to Canada for my wedding. When I returned to Japan, I watched a video of the game. I was moved by both the spirit of the players and the energy of the fans. I taught English to many of the members of the baseball team last year. I remember them being so tired all the time. They practiced everyday and finished well into the night. Their hard work paid off, and their dreams came true. They helped make this a magical summer for us all. I went to the Koshien this summer vacation. I went there because the high school baseball club won the Saitama championship. I went there as a music club member. It was hot. I cheered for them. I was very tired. They lost the first game. But, I am very happy because I could go there. I want to go there again next year. 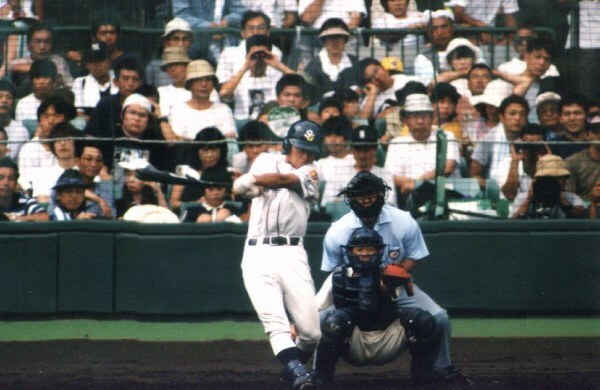 Editor's note - Baseball is Japan's unofficial national sport. The Koshien is the yearly invitational high school baseball tournament. It is the crown jewel of Japanese baseball. Only one team from each prefecture, except for Hokkaido and Tokyo who send two, can make it to this tournament. Unlike professional baseball, whose teams represent large cities, the Koshien offers the chance for even the smallest villages to be seen in the national spotlight. The unique costumes and traditions of regions throughout Japan are displayed by the fans. This was Seibo's first time to participate in the tournament. Our school's Christmas ceremony was attended by all the teachers and students. We received the Christmas Mass at the chapel in our school, and turned on the lights on our Christmas trees. We had a beautiful candle service. The members of the hand bell club performed at the Mass. Before the ceremony, students decorated the trees. Students made cookies, candles, wreaths and Christmas cards. We sold these things to raise money for charity. In America, I hear that they have Christmas holidays and that they spend time with their families together. Then, many go to Church to pray. They spend a Christmas night quietly. Christmas is not a holiday for Japanese people. Most people have to work on December 25. But Christmas is a romantic time for Japanese couples. Another Christmas custom is that they give presents to their friends and family. These days, many Japanese people do, too. This past Christmas I prayed to god that we will all find happiness. It is the best present, I think. I hope that everyone had a wonderful Christmas and a happy New Year! Now it's time to go back to your desk and do some serious studying for entrance exams! after school, or whatever you enjoy doing in your free time. You have to, however, if you want to pass your exams. Once you pass the exam, you just feel like you've been given wings, and that you can fly anywhere that you want to go. Enjoyable things await you if you can endure this test! Her name is Kate Blackwell. This is her first visit to Japan. She loves it here. She went to Kyoto, Hiroshima, and Tokyo. She wants to go to Tokyo Disneyland. Her birthday is July 31. She has four people in her family. Her hobby is listening to music. She likes Dirty Dancing (movie). She doesn't like comics much, but she likes Snoopy. She likes basketball, and Australian football. Her name is Kate Seiben. Her birthday is March thirtieth. She wants to go to England. She listens to music at her home. She likes soccer and net ball. She doesn't have an aboriginal boomerang. She has a sister. She has a dog, a turtle, some sheep, and some fish. She likes chicken and rice. She likes 'wafuku' or Japanese clothes. She thinks that Japan is very hot. She has studied Japanese for two years. His name is Adrian. He likes playing sports and listening to music. He belongs to a tennis club. He hopes to become a pro tennis player, and to make a lot of money. He is fourteen years old. His favorite food is pasta. In his free time, he plays tennis, table tennis, and swims. He likes Japanese food. He thinks that Japan is a very busy place. He goes to bed at 10:00. He likes many musicians. He likes tennis better than baseball. He has a girlfriend named Melissa. She is 15 years old. Her name is Jessica Kasza. This is her first visit to Japan. She likes Australia better than Japan. Her first impression of Seibo Gakuen was that it was very big. She likes math. She likes soccer. She enjoys all kinds of music. Her favorite musician is Ben Lee. Her favorite color is blue. She loves pizza. Her favorite Japanese food is yakisoba. She likes dogs. Her favorite Japanese character is Hello Kitty. She doesn't know who Hidetoshi Nakata is. She likes horror stories better than love stories. Her name is Kathryn. Her birthday is November 28. Her favorite musician is the Backstreet Boys. Her favorite move is Star Wars. She likes both summer and winter. She wants to become an artist in the future. Her favorite sports are gymnastics and net ball. She likes to read books after school. She likes ramen. Kathryn says that Australian students like to go to the movies. My first impression of Japan was that it was very hot, but also very beautiful. I love it here and I hope to come back one day. Everybody has been very nice and has made me feel right at home. My memory of Japan is the weather. It is very hot and humid, unlike in Australia which is just hot. There is also a lot of unexpected rain which rarely happens in Australia. I would have likes to be here in the winter to see the snow. I stayed in Japan with Kanako Ohno and her family for three weeks. I had a very good time here, and I was lucky because the Ohno family took me to many different and interesting places. I also traveled to Kyoto and Hiroshima with the people from my school. It was great to see so many temples and we learnt a lot about the history of Japan. Japan and Australia are very different countries, but I enjoyed experiencing the Japanese culture. I will always remember my trip to Japan and I hope I can visit again one day. My family hosted and Australian student. Our guest was Melanie. She can play the flute very well. I play the flute in music club. So, we played at the culture festival together. It was fun! We have been to Disneyland, and we have gone shopping. She bought many pretty things. All the members of my family are interested in English, especially my father who can speak English very well. So, we spoke English a lot at home. Because of my poor English, it was hard for me to communicate with Melanie. So, I want to speak English better than I can now. I hope that Melanie has good memories of her stay. It was a good experience for Melanie and I. An Australian boy came to my home to stay for about three weeks. At first, he was shy. When my brother and father talked to him, he wouldn't open up. But after a few days had passed, we were able to joke around and he opened up to us. Eugene loves football. So, we played a football video game. When I fouled him, he said, "Red! Red! Red!? And if I didn't get a red card he would say, "Oh! Stupid!? My brother and I started to speak English too while we were playing. We would say things like "Great!" and "Nice Goal!" We started to use English more and more without even knowing it. We were very surprised. By the way, he studies Kung Fu. So he taught me. He is very tall and muscular. His Kung Fu poses and moves are very cool. We sometimes went outside and played with a boomerang. Because of this experience I am able to talk with foreigners more freely, though I used to hesitate to do it. I am very glad that my brother hosted an exchange student. It is quite good, because I could make a new wonderful friend. I had a good time! Because, I could speak a lot of English. I made many Australian friends. English is difficult, but I like English. I wonder if the exchange students like Japan. I hope so. Lastly, thank you for giving me this chance. I had a great time! Talking about international society - today, on the 16th of September, 25 students and 3 teachers from Faith Lutheran Secondary arrived at Narita airport for a three week visit. Since I have been an exchange student, I know how difficult it is to understand each other when we have different languages and cultures. But, communication is necessary if we want to construct a peaceful world. I hope that we all, Japanese and Australian students and teachers, will make lifelong friends during this visit. Q: How were your home stay families? Generally, everyone felt welcomed and appreciated being part of a Japanese family. Q: What memories will you cherish from this trip? Kellie: For Julie and myself it was definitely the Peace Museum in Hiroshima. It's a piece of history that you always read about. But not until you go to the museum do you feel the impact/emotion of the situation. Q: When you think of Japan, what's the first thing that sticks out in your head? Kellie: Being able to appreciate the differences between the two countries. Julie: When I was walking in Osaka, there were people in a black bus shouting bad things at me. When we went into a restaurant in Hiroshima our students felt safe and wonderful. The warmth of the Japanese people was great. Q: If you could take anything back that was very Japanese to Australia, what would it be? Kellie: How the home stay families opened up their homes to us.